Kaka started his storied career with Sao Paulo in Brazil, where his performances attracted the attention of Europe's leading clubs and prompted a move to AC Milan in 2003. 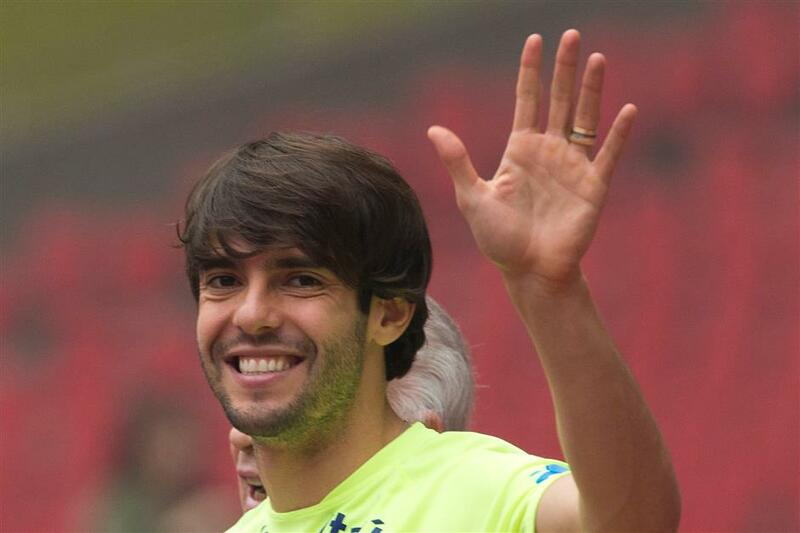 Brazil's Kaka waves as he arrives for a training session ahead of a friendly match against Argentina at the Bird's Nest National Stadium in Beijing in this October 10, 2014, photo. The former Ballon d'Or winner said on December 17, 2017, that he is retiring from soccer at age 35. Former Brazilian World Cup champion Kaka announced his retirement as a player on Sunday, suggesting that a management career at his old club AC Milan could be on the cards. "I would like to take part in a club in a role more like... a manager, a sporting director — someone between the field and the club." Kaka, 35, said Milan "recently made this proposal". On his Twitter feed, devout Christian Kaka, who was part of Brazil's 2002 World Cup-winning team, wrote: "Father, It was much more than I could ever imagined. Thank you! I'm now ready for the next journey. In Jesus' name. Amen." He started his storied career with Sao Paulo in Brazil, where his performances attracted the attention of Europe's leading clubs and prompted a move to Milan in 2003. It was while at Milan that Kaka picked up the Ballon d'Or, awarded annually to the world's best player. He was the last player other than Cristiano Ronaldo or Lionel Messi to receive the prize. He also helped the Italian side to a Serie A title in 2003-04 and propelled Milan to 2007 UEFA Champions League glory, scoring a competition-best 10 goals as the club was crowned king of Europe for the seventh time. The hugely talented attacking midfielder joined Real Madrid in 2009 for a then world-record transfer worth 68 million euros (US$89 million), but Kaka struggled to consistently reproduce his top form in the Spanish capital. He won the Copa del Rey in 2011 and was part of Jose Mourinho's team that won the league crown a year later, but he fell out of favor in Madrid and returned to Milan on a free transfer in September 2013. Kaka was unveiled as the face of Major League Soccer's expansion franchise Orlando City in 2014, heading home for a brief reunion with Sao Paulo ahead of the US club's debut season in 2015. He scored the MLS team's first ever goal and was the North American league's highest-paid player for three years running before leaving Orlando in October. He scored 29 goals in 92 international appearances for Brazil, although having been overlooked for the 2014 World Cup on home soil he was also ruled out of last year's Copa America Centenario by injury. In November, media reports said he had been considering a move to Guizhou Hengfeng Zhicheng in the Chinese Super League. Spain's La Liga paid homage to Kaka on its Twitter account, saying: "One of football's greatest talents is hanging up his boots after a glittering career." However, Kaka said his transition off the pitch wasn't being taken for granted. "The fact of having had successes as a professional player does not mean I will or won't be a good manager. So I want to prepare myself for this going ahead, to study, to follow, to be closer to certain clubs, especially those where I played," he told Globo.